Traditional Jul Candle. The number of branches representing the number of kids in a household. Julebrød (Christmas Bread). It’s a kind of raisin bread. Traditional Pepperkaker Cookies. Folks often hang them in their windows. December 7, 2014. 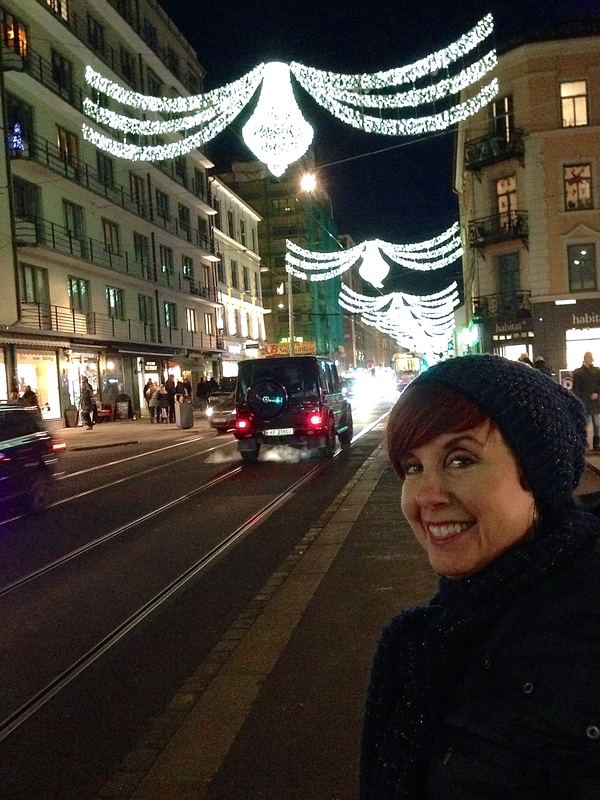 We returned from the States to find that Christmas had sprung up overnight in Oslo. But not in the screamingly obnoxious American way, where every conceivable surface is plastered in a Crayola kaleidoscope of shiny ornaments, Santa Claus effigies, and tinsel. Here in Norway, they take a more subtle, elegant approach. No one clutters their yard with inflatable reindeer or animatronic tableaus depicting the North Pole. In most stores, you’d be hard pressed to find much more than a wreath or a few wrapped presents in the window. And I’ve not spotted even one colored strand of lights. In a country with less than six hours of daylight at this time of year, white light — and lots of it — is the predominate holiday accent. Bright strands festoon most of the main shopping streets and a few window boxes, while most homes feature a white paper star in each window, or a lit candelabra. Every restaurant and store advertises their open hours by placing lanterns lit with real candles outside their front door. Candles cover every available surface inside, too, and I’m constantly surprised that the sounds of the season aren’t punctuated more by the sirens of fire engines. 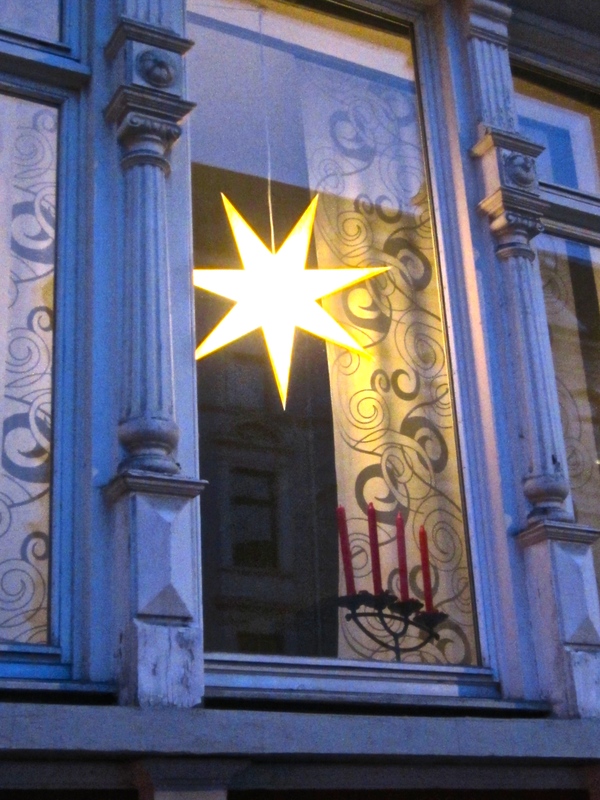 A paper “Moravian” star and candelabra commonly adorn most Norwegian windows. 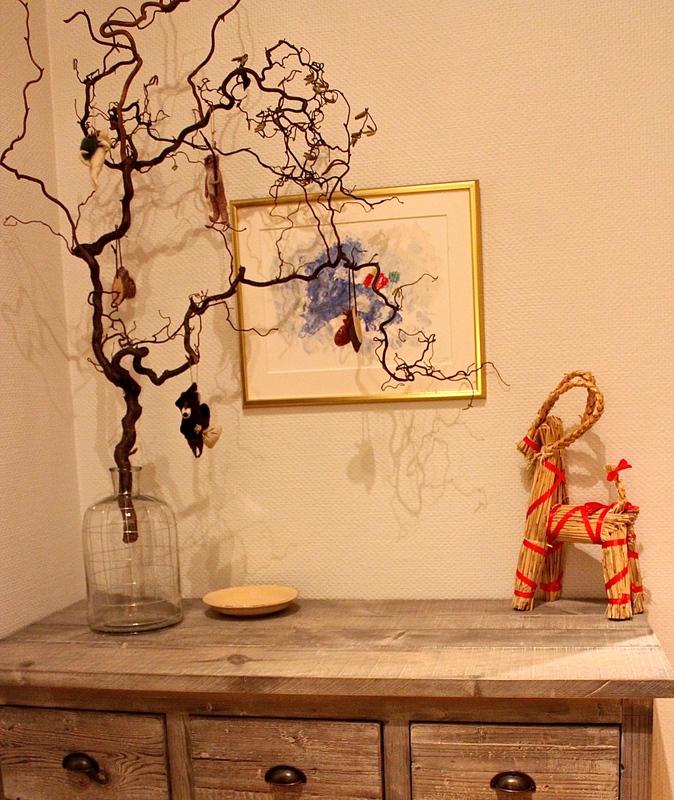 Natural decor is big, with birch logs and bark being used for candle holders, carved ornaments, and wreaths. Shoppers tread over doormats made of fresh evergreen branches that release the spicy scent of pine throughout the store. The florist stalls in the city square stock enormous clumps of real mistletoe and centerpieces made of arctic lichen and heather. And my absolute favorite custom is the Julenek (Christmas sheafs) — bundles of red-ribboned wheat for the birds that you’ll see staked in many front yards. According to legend, if you sweep away a circle in the snow beneath the Julenek, the birds will dance around it at midnight on Christmas Eve. 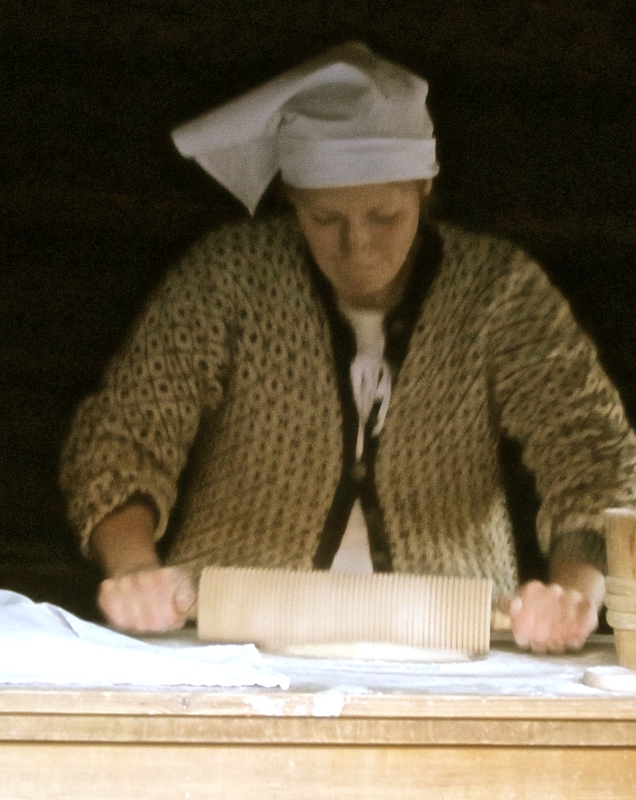 A museum docent rolls out lefse. Probably one of the best places to experience Christmas traditions is the outdoor Norsk Folkemuseum (Norwegian Folk Museum). At any time of year, it’s a great place to see an incredible array of Norwegian folk architecture, but at Christmas, it’s more than magical. You can ride in a real sleigh, watch costumed folk musicians and dancers perform, eat buttered lefse (Norwegian potato flatbread), tour traditionally decorated, ancient log-cabin homes, attend a Christmas service in an unbelievably gorgeous medieval stave church, and shop for hand-knitted sweaters and other awesome gifts at the annual Christmas market. My Julebukk sits on the right. On the left is a Trollhassel (Witch Hazel) branch. Norwegians often hang small ornaments on these at Christmas. My favorite purchase this year was an enormous Julebukk (Christmas Goat). A legendary beast, the Julebukk possesses a checkered past, apparently having begun life as one of the two goats who ferried the Norse god Thor across the sky. Later, after a stint as a mischief-maker who accompanied young pranksters during wassailing, the Julebukk reformed himself and began delivering Christmas gifts to children. Eventually, he was replaced by the Julenisse (Christmas elf), but you’ll still see him grace the tables of holiday gatherings. A little more about the Julenisse. The closest thing that I can liken him (or them) to is a garden gnome. One gentleman explained to me that the nisse live in houses and barns. If you treat them well, they’ll protect your home and do your chores, but if you don’t feed them and are a lazy farmer, they’ll become hostile, pull tricks on you, and may kill your animals. Apparently, the Julenisse is a special elf (or group of elves) who wear red hats and expect to get fed on Christmas Eve in exchange for gifts. 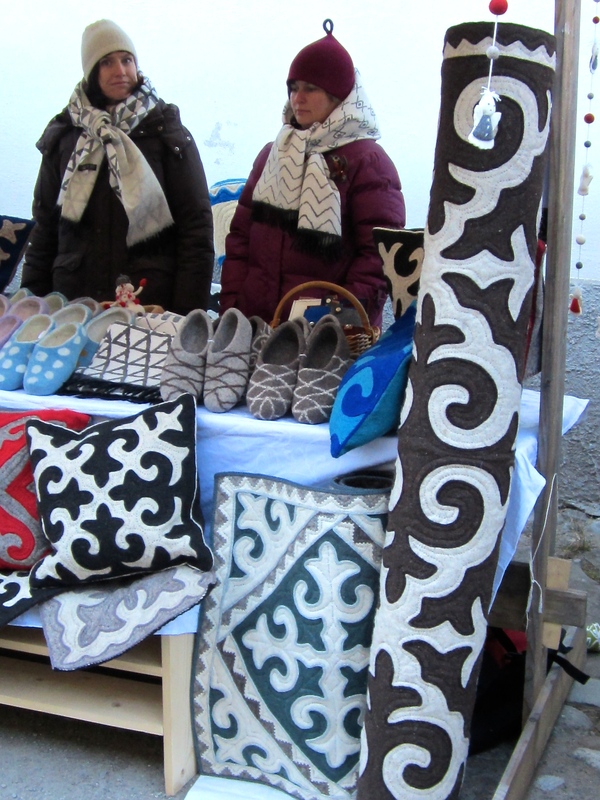 Woolen goods for sale at the annual Norwegian Folk Museum Christmas Market. My personal brush with the Julenisse occurred last year during my first trip to the folk museum. While waiting in line for the cash station, I was approached by what looked like a giant, red-robed Father Christmas holding a big wooden spoon. (The Julenisse is apparently a shapeshifter and can morph to look like Santa when a more universally commercial figurehead is needed.) He spoke to me in Norwegian, and the lady behind me translated, “He wants to know if you’ve been a good girl. If you have, he’ll give you porridge to eat, but if you haven’t, he’ll hit you with the wooden spoon.” I opted for the porridge, of course, but later the lady told me that as a child, she thought the sticky, rather tasteless stuff was almost a worse punishment than the beating … and on that note … Merry Christmas, kids!